If you are looking for a chewable B12 to get the benefits of both cyanocobalamin and methylcobalamin, look no further! 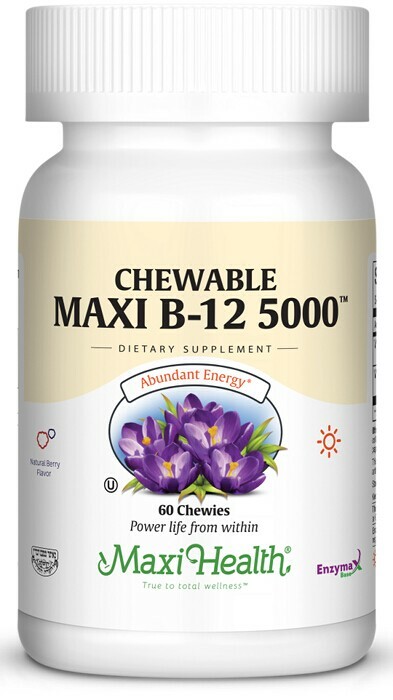 Our chewable Maxi B-12 5000™ has exactly what you are looking for. We named it Maxi B-12 5000™ because you get 2500 mcg of each. Vitamin B 12 is essential for healthy nerve cells. It supports the building of genetic materials of all cells and the production of enzymes. It is a key micronutrient that supports lymphocyte (a type of white blood cell) functioning. Try natural berry flavored, chewable, Maxi B 12 5000™! Other Ingredients: Sorbitol, fructose, vegetable magnesium stearate, modified cellulose gum, natural berry flavor, Enzymax® (calcium carbonate, bromelain, papain, lipase, amylase, protease, silica), natural cherry flavor. This product contains no animal products, soy, wheat, gluten, yeast, salt, milk, artificial preservatives, flavors, or colorings.